It’s Halloween again, woot woot, my favorite holiday after Saint Patrick’s Day, New Year’s Day, and Bastille Day, when baguettes fall right out of the walls. I bet you thought I’d stopped doing Fun Friday Facts, and well, you’re not wrong. But I’m going to start again because a cursory glance at my traffic data reveals that’s all anyone’s reading around here. In previous Halloween posts, I’ve discussed haunted places; the origins of Halloween, trick-or-treating and jack o’lanterns; and candy. These days, we still practice many relatively ancient Halloween traditions in one form or another, but there are also some traditions that have fallen out of favor. In the past, when getting married was a much more important part of a young woman’s life, several Halloween rituals centered around trying to help a young lady land a man. In Ireland in the 1700s, a young woman might hope to find a ring in her mashed potatoes at dinner on Halloween night, which would bring true love or at least a binding contract within the next year. (The tradition continues in Ireland to this day, but the ring, along with other small charms, is baked into a cake called a barmbrack.) Young women in Scotland would name hazelnuts after each of their boyfriends, then throw the nuts into the fire; the nut that burned straight to ashes instead of exploding either did or did not represent the man she would marry, according to which (presumably haggard, old and warty) fortune-teller she was talking to that night. Other superstitions say that eating a bedtime sweet made of hazelnuts, walnuts and nutmeg on Halloween night will cause a young lady to dream of her future husband. Peel an apple in one long strip and throw the peeling over your shoulder; the peel will fall in the shape of your husband-to-be’s initials (no, no it won’t, not really). When you’re planning your kid’s Halloween party, you may want to skip the bobbing for apples – the first person to successfully bob (?) an apple will be the first to get married that year. 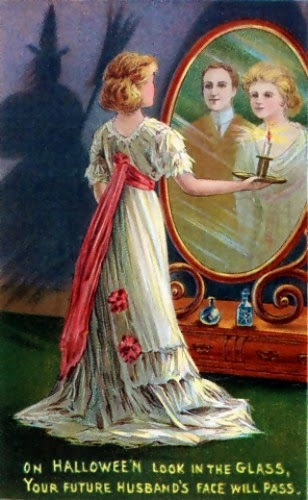 Another technique involved standing in front of a mirror with a candle in a darkened room; allegedly, the future husband’s face would appear in the mirror, floating behind the single lady’s shoulder. Sounds like a great plan, if you want to marry a murder-ghost from another dimension. Now that you mention it, I think my grandmother told me to do this. Fortune-telling was popular at Halloween parties in the late 19th and early 20th centuries. One game involved using milk as invisible ink – hosts wrote fortunes in milk on slips of paper, than inserted them into walnut shells. Later, party guests would warm the walnut shells, causing the milk to burn and totally mystical writing to appear on the slips of paper. This is your chance to convince your friends they’re ALL GOING TO DIE, or get married, depending on your personal idea of a fate worse than death. As some of you may know, many Christians are freaked all the way out by Halloween, because tiny witches and zombies are pretty scary. Many Protestants celebrate Halloween as Reformation Day, because it’s the day that Martin Luther nailed his Ninety-Five Theses to the door of All Saints’ Church in Wittenberg. I always pictured him doing that furtively under cover of darkness, but I guess not, because he timed it to coincide with one of biggest holy days of the year. The children of these families dress up as characters from the Bible or as Reformers, which I don’t even know what that costume might look like. Many Christians don’t celebrate Halloween at all. Some “celebrate,” if you can call it that, by sending their children to Hell Houses, which are like haunted houses except they give you a glimpse of the eternal torment waiting for you in the afterlife. Others take the opportunity to proselytize by handing out religious tracts to kids who come trick-or-treating. And you thought the guy handing out sugar-free candy was bad.